The University of Utah Entertainment Arts and Engineering program held their annual EAE open house this past weekend. Members of press and public alike were welcomed into the fine arts building to see the height of the campus’ digital creativity. 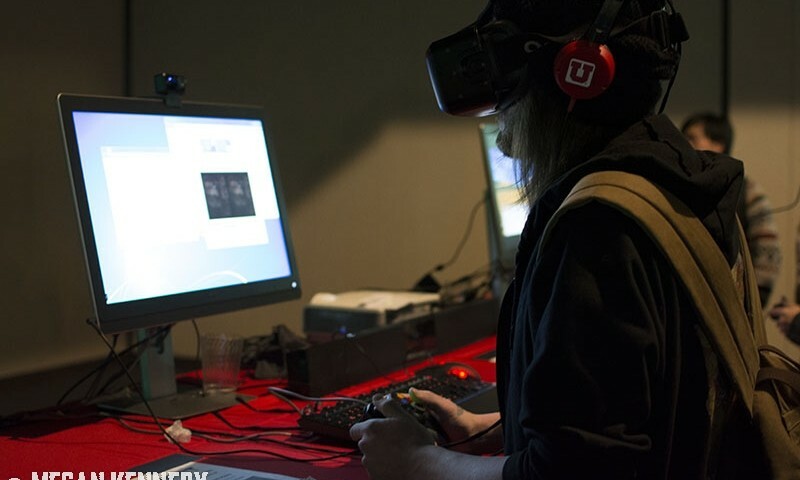 For three solid hours, attendees got their hands on projects created by first year students all the way to thesis games, which were shown in their own room with projectors and tournaments. Demoed almost exclusively on PC, these games were slated to hit various consoles including Xbox Live Arcade, Steam Greenlight, Apple’s App Store and Google Play. Moving on in my adventure I encountered Eye of the Swarm. This physics based combat game had players controlling a swarm of items that spin around a focal point. These items deal damage when colliding, but also get destroyed when hit by damaging objects. Swinging them around your focal point with the right thumb stick and moving them around the screen with the other became not only a challenge, but a fun experiment in underwater physics. The controls were incredibly crisp for such a new concept, and trying to fight off various forms of sea life, including a giant turtle boss, became an exciting challenge. Another mobile title available to play was Escape from Crete, created by student Sam Morris. This game is modeled to be a side-scrolling endless runner. As Icarus, you can glide over objects or jump on top of them. As you progress, your speed gradually increases until you reach maximum velocity. Getting hit and double-jumping cost the player feathers. When the feathers are gone, so is your fun. The game has a very simple interface with basic, stylized art. It did, however, have what every mobile game of its genre needs—easy learning curve and addictive challenges. This will hit the Apple App store soon. Across the hall from the open lobby was the Thesis Room. Packed with students wanting to see the final projects of their graduating peers, this room included a first-person runner titled 404 Sight. A blend of Mirror’s Edge and Assassin’s Creed, this game has a unique feel and drive, and was holding quite the queue while people waited to play. Next to it was All is Dust, a horror game made for Oculus Rift. Was it scary? Absolutely. Was it immersive? Too much so. Continuing on, gamers were treated to Point and Think, an experimental point-and-click adventure where you manipulate the NPCs’ thoughts, changing their behaviors and actions in the world. The layout was similar to the frames of a comic book, with cartoony characters exploring the world. The final game of the room was Hostile Territory. This third person shooter puts players in control of various demons battling for the souls of the damned. Not only could one play this fun-filled bloodbath, but there was a tournament close to the end of the night. Even though the EAE program at the University of Utah is relatively new in comparison with other focuses available on campus, the amount of incredible games coming from everything from first year to final year students is simply stunning. This is yet another reason why Salt Lake City is a great place to live and more importantly, a great place to game.